Canadian Prime Minister Justin Trudeau is set to apologize for the damage done by residential schools for First Nations children in Newfoundland and Labrador. He will do so on November 24. Like many apologies, I suppose, it is not enough to erase the trauma suffered by so many First Nations families. In the end, however, there are limits as to what can be done to address the crimes and the mistakes of the past. Acknowledging, apologizing, and a pledge to learn and never let it happen again: it is incomplete, but much, much better than nothing. I am inclined to be charitable towards Trudeau, and those Canadians committed to pursuing truth and reconciliation. My own country, after all, has shown a disturbing and consistent unwillingness to examine much of its history critically, and this tendency has been even more pronounced than usual in the response to the important dialogues surrounding police violence against people of color and the efforts to remove racist Confederate monuments. Earlier this week I appeared on a local public radio call-in show called “Connections,” hosted by Evan Dawson, on WXXI Rochester. (The audio is here). I was on the show to talk about Native America but also to discuss the growing movement on college campuses and in municipalities across the country to recognize Indigenous Peoples’ Day every year on the second Monday in October. Peter Jemison, from the Ganondagan State Historic Site, joined me on the program. This movement, as I pointed out in an earlier post, is viewed as an affront by many Italian-Americans whose ancestors suffered discrimination when they immigrated to this country. There may be grounds for compromise here, as Father James Martin pointed out earlier this week. “If we abolish #ColumbusDay in favor of #IndigenousPeoplesDay,” he tweeted, “we still need a day to honor Italian-Americans, who were once marginalized. 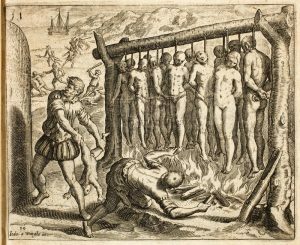 I’d suggest a new name for #ColumbusDay and a new day for #IndigenousPeoplesDay.” Maybe there is something to be said for this, a compromise. But the political right has not couched their opposition to Indigenous Peoples’ Day in these terms,and they have shown little interest in compromise or discussion. Bob Lonsberry, for instance, a long-time conservative radio personality in Rochester, tweeted out last Monday that “other than the birth, death, & resurrection of Jesus, the discovery of the Americas by Columbus was the most important event in human history.” There are a lot of obvious problems with this argument, but this sort of sentiment has been widely embraced on the political right. Matt Walsh, a columnist for The Blaze who tweets @MattWalshBlog, told his many followers to not “let anyone tell you it’s wrong to celebrate the great men who built our civilization.” Kurt Schlichter, another pundit aggressively active on Twitter, said that “the European conquest of the Americas was history’s greatest achievement.” The Daily Wire posted an incredibly racist and offensive video, since removed from their site with apologies from the editor, depicting the Americas in 1491 as a land of savagery, cannibalism, and superstition that was refined and civilized by Christopher Columbus. Not one mention of native peoples. We are witnessing a reaction against the very notion that native peoples have a place in this story that is worth remembering and retelling. Indeed, assertions such as these, like all assertions based upon shoddy historical reasoning, I find deeply troubling for a number of reasons. First, they completely deny the enormous human consequences of European imperialism and colonialism in the Americas. Millions of people died as a direct result of colonization. The avarice, bigotry, and violence of these explorers is so apparent in the documentary record that to ignore it or deny it requires a positive act of will. The most conservative critics of Indigenous Peoples’ Day show a deep lack of sensitivity to the sufferings of native peoples, to say the least, and a willingness to consign the historical experience of millions of people like them to the dustbin of history. Like a guy named Bruce, who was the first caller on Evan Dawson’s show. Native peoples, Bruce suggested, were savage and violent, their lives poor, nasty, brutish, and short. 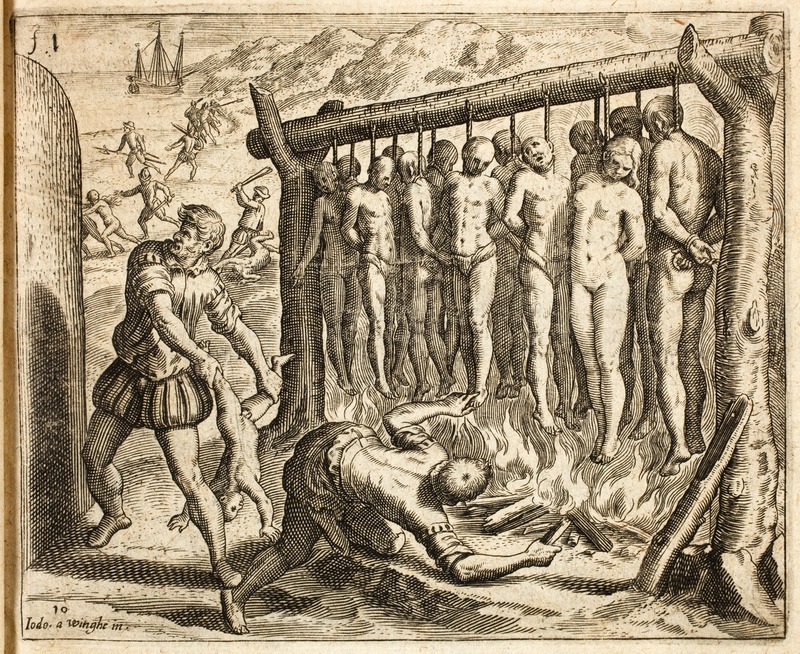 Although Europeans did some “bad things” here and there, it was all in the name of progress. Indians should stop bitching and moaning, Bruce implied. After all, he could lose his property at any time should the government exercise its power of eminent domain, he said, so in that sense he was just like the Indians. Join the club, he said. No, Bruce. No. White dudes who have the luxury of listening to NPR in the middle of the day, I am willing to wager, generally do not suffer dispossession at the hands of the government. And certainly not in the systematic and continent-wide scale experienced by America’s native peoples. Second, these assertions celebrate what many scholars and activists now call settler colonialism, the legacies of which are still felt in very real ways by native peoples. Settler colonialism encourages the erasure, the dismissal, of native peoples and their concerns from the realm of rational discourse. The country was not being used, these conservatives argue, and only Europeans with their refinement, religion, and culture made it better. It is racist in its dismissal of both the inherent beauty of so many indigenous cultures and the blood-drenched history of Europe for centuries before Columbus sailed out into the ocean blue. Life in fifteenth century Europe was no walk in the park. 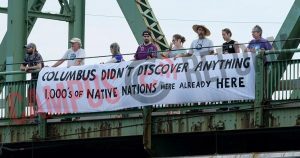 Commemorating Indigenous Peoples’ Day–and this is a point that so many of these right-wing pundits do not see–does not belittle or demean the western tradition. What it does do is allow us to pay attention to the experience of those native peoples whose losses were Europeans’ gain, and who have endured and survived through five centuries of discrimination, dispossession, and slaughter. If, after all, any number of people in our nation’s history had had their way, native peoples would be gone: They would have been wiped out by warfare and epidemic and chronic disease; or they would have been “removed” to make way for the “settlers” who championed the rise of Andrew Jackson in the first few decades of the nineteenth century; or confined on tiny reservations until the missionaries and teachers and government farmers wiped away any trace of their identity as native peoples; or assimilated into the American body politic; or “terminated” in the middle decades of the twentieth century, with the reality of their native nations erased by congressional statute. Indians were supposed to disappear. If any number of people had their way, Native American people would not be here to call for an Indigenous Peoples’ Day. Finally, the reaction to Indigenous Peoples’ Day coming from the political right reflects the increasingly oft-expressed anger of white males at nearly any expression of grievance by people of color. Protestors who assert that “Black Lives Matter, and who complain about the alacrity with which militarized police deploy violence against African Americans is dismissed as violence; the protests of principled men like Colin Kaepernick and other African-American NFL players is regarded as an assault on the flag, and a demonstration of a lack of patriotism, with no discussion whatsoever of the issues that generated those protests. Suggestions that racist Confederate monuments be removed or revised is treated as an assault on white identity and southern heritage; and native peoples, meanwhile, are told to get over it. The crimes you “allegedly” suffered took place long ago, and therefore the problems occurring in your communities are entirely your fault. We had nothing to do with that. I have been teaching and writing about Native American history for a long time, more than thirty years. Every day when I talk with my very good students, I realize that I still have so much to learn. Every time I read new scholarship, I realize that there are so many more stories out there that we should tell. I will be a student of this subject forever. But one thing is so very clear to me, and the tweets I mentioned above are the evidence: Racism towards Native Americans is a real thing. The inequalities experienced by native communities are significant. If you have followed the posts on this blog at all, or the stories I share on my Twitter account, you will see this plain as day. The statistics do not lie. New York, where I have lived for all but five of the last twenty-seven years, became the Empire State, as Laurence Hauptman has so ably shown, through a systematic program of Iroquois dispossession. You could not have one without the other. The transactions through which New York acquired Iroquois land happened a long time ago, but these were transactions that violated federal laws the United States lacked the power and perhaps the willingness to enforce. The Supreme Court has held that these transactions occurred so long ago that nothing can be done to right these wrongs, but that does not mean that the rights retained by native peoples should be ignored, or their history dismissed. New York’s native peoples have seen, through a long history, their homelands invaded. They experienced waves of epidemic disease. They faced dispossession, and then the effort to “remove” them to new homes in Arkansas, or Wisconsin, or the Indian Territory, and then to re-educate their children, and disable their governments. Disease, warfare, dispossession, diaspora: the injuries occurred a long time ago, but their legacies remain. And when native peoples and their allies suggest that we commemorate that history on a special day, one associated with the author of a genocidal process against native peoples, their arguments are dismissed. Look at the ground underneath your feet. If you live in western New York where I live, in towns called Irondequoit, or Nunda, or Geneseo, or Tonawanda, think about the processes of dispossession that made New York state what it is. If you believe that laws matter, that the Constitution matters, that the pledges in a treaty that guarantees to the Six Nations the right to “the free use and employment of their lands” matters, then drop the whining about Indigenous Peoples’ Day. It is not a good look. It makes you sound like a racist buffoon. I totally disagree with this Corley, but thanks for reading the blog.